This episode’s money story features an interview with Adrian Gallo, a PhD student at Oregon State University. Adrian serves as a resident advisor in a fraternity house close to campus. For most of his four years in the role, it was a dream side hustle: high-paying (in defrayed costs), low time commitment, and personally gratifying. However, when the house experienced a calamity, the time he had to spend in the role rocketed up; his research suffered, and he had to have difficult conversations with his advisor. We discuss the pros and cons of side hustles generally and resident advisor roles in particular, including how this side hustle frees Adrian from the financial stress some of his peers experience. Adrian Gallo is a fifth year at Oregon State studying carbon cycling. He also hosts a radio show, Inspiration Dissemination, which interviews grad students about research and their path to grad school. 2:45 What is the scope of your role as a resident advisor? Adrian started as a resident advisor concurrently with starting grad school. His contractual obligations are minimal: he is a liaison between undergraduates and landlords and responsible for dealing with big-picture items, such as replacing appliances. The role is in a fraternity house; Adrian is also a member from his undergraduate years. He knew the possibility for growth inherent in participating in this fraternity, so he decided to also serve as a mentor to the fraternity members. He helps with big-picture planning such as five-year goals. The time commitment of the role fluctuates throughout the academic year and has also varied year-to-year. When the fraternity leadership was running well, Adrian didn’t do as much, but he became more involved when it was warranted. On average, the time commitment of the position is 2-3 hours per week, which includes two hour-long meetings. Typically, he chats with the kitchen manager or house director as well a few times. On the ‘big’ weeks, the job has taken 20+ hours. 7:33 What pay and/or benefits do you receive for the role? Adrian doesn’t pay rent (the average rent in Corvalis is $500 to $700+) and lives very close to campus so it is quite convenient to get to and from campus. He has two bedrooms in the fraternity house (one serves as his office) and his own washer/dryer. Utilities and a parking spot are included. He also receives food service during the academic year: breakfast, lunch, and dinner five days per week. He can get to and from the house and eat a pre-prepared meal in just an hour lunch break. This is an amazing degree of time savings. 10:09 How did you land this resident advisor position? Adrian initially inquired with the local fraternity chapter about finding a place to live and a roommate. Instead, they offered him the resident advisor position, which he though was outlandish. He was nervous about living in a fraternity house with approximately 50 college students. However, after a few phone conversations, he decided to give the position a try for a year. After one year in the position, he realized he really enjoyed the role and had found a home. 13:41 How do you make sure you’re fulfilling the expectations of you as a graduate student while holding this side position? At first, there was no problem as the time commitment was so low. Last year, 10 rooms in the house flooded and the floors had to be removed. The damage was so extensive that it couldn’t be fixed right away, which deprived everyone of sleep and wore them down. Adrian had to spend significant time dealing with contractors (all day on the phone) and contacting the landlords, which kept him out of the lab for some time. He wishes he had asked for help from the student leadership in dealing with this situation much earlier as the time management was so difficult. 17:00 Did you let your advisor and co-workers know what was going on during the house disaster? For about a week and a half, Adrian wasn’t at work and finally his advisor initiated a conversation with him about what was going on, at which point Adrian filled him in. He wishes he had been more forthcoming. Adrian’s advisor knew about the position and that he was able to balance the roles well for the first two years. His advisor started to question whether the resident advisor role was compatible with Adrian’s role as a graduate student. Ultimately the floor repair took approximately 2.5 months. Adrian learned more than he ever expected to about working with contractors, repairs, etc. The time commitment was very intense at the beginning but tapered over time. 22:22 How did you decide to stay in the resident advisor role and also convince your advisor that it was a good idea? Adrian finds witnessing and facilitating the growth of the undergraduate fraternity members so fulfilling that he didn’t seriously consider resigning his position. Another job wouldn’t compare to the resident advisor role. 25:10 Have you received any additional intangible benefits aside from the mentorship that you’ve found fulfilling? Staying in close contact with the undergraduates helps Adrian in his teaching role because he can make relevant references, which his students find engaging. 27:28 What might cause you to resign this position? Adrian had second thoughts about the position during the flooding situation, particularly because he couldn’t sleep in the house with the soundproofing missing. The sleep deprivation really got to him; he couldn’t think or work well. 30:30 Do you think you’ll continue with the role even through writing your dissertation? Adrian already has written his master’s thesis while in the resident advisor role and actually found it helpful to live in the fraternity house. He would come out of his office mentally exhausted and find refreshment in the escape of interacting with the undergraduates. This approach isn’t for everyone, but it worked well for Adrian. 33:28 How has your role as a resident advisor affected your finances? Adrian paid off his student loans from his undergraduate degree and bought a car. He bought a nice mountain bike, which bring him a lot of joy and health benefits. The chief intangible benefit is that he doesn’t have to feel concerned about his finances. Many of his friends have to budget very tightly to make it on their stipends. In contrast, Adrian can absorb unexpected expenses without worrying. As an undergraduate paying his way through college, Adrian found concern about finances to be a constant cloud over his head, but it’s not something he experiences any longer thanks to his side hustle. The resident advisor role frees Adrian from the constant cloud of financial stress in exchange for (usually) only a few hours per week. The benefits of this role have on balance been very much worth the time put in, even though he went through the tough period during the renovation. Thankfully, his advisor was ultimately supportive. Resident advising is a great solution to the problem of insufficient stipends, and often comes with the side benefit of mentoring students. There are a few other graduate students serving as resident advisors to the fraternities and sororities, including two who had not previously been involved in the Greek system. A social scientist might find it very interesting, and in fact the person who held the role prior to Adrian used observations from her resident advisor role in her dissertation. 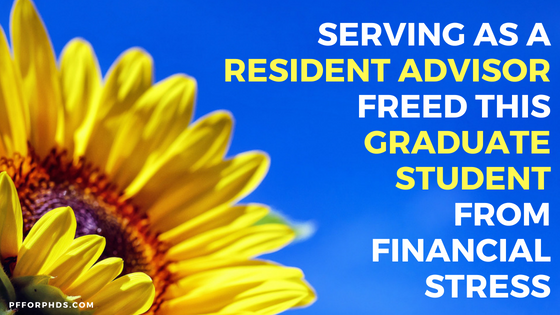 Try serving as a resident advisor out! Being willing to experiment with this role has enabled Adrian to make significant financial progress during graduate school. What’s the worst that could happen by saying “yes” for a year? Undergraduates are worth getting to know as well (networking)!